PowerAudio music player brings you the all new music experience. It features an easy to use interface and best in class audio quality. 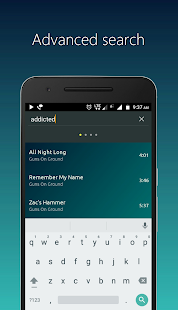 You can browse songs by albums, artists or playlists. PowerAudio music player has a separate tab for all your favorite tracks, you can add songs to your favorites from any tab. 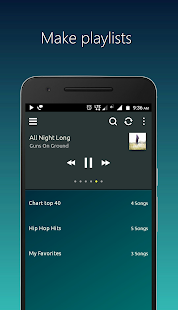 PowerAudio music player supports playlists, you can create you own playlists with the tracks you want. 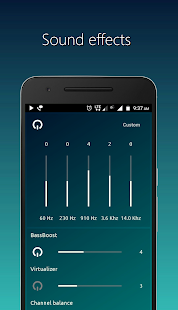 This music player features a powerful equalizer with BassBoost and Virtualizer. You can choose from a variety of music presets or create your custom preset. Please note this is not Poweramp. PowerAudio music player is not related to Poweramp music player in any way. Poweramp music player is another software from another developer. READ_EXTERNAL_STORAGE : required by PowerAudio to find songs on storage. WRITE_EXTERNAL_STORAGE : required by PowerAudio to delete or modify playlists and songs. INTERNET : required by PowerAudio to check for updates. WAKE_LOCK : required by PowerAudio to play music in background. WRITE_SETTINGS : required by PowerAudio to set Ringtone.